We’re not going to lie: Popcorn is a snack for all seasons and all reasons. In its simplest form, this bite-sized treat serves as a low-calorie, crunchy nibble that can help you stick to your healthy eating resolutions. But, add a few creative toppings and -bam!- you’ve got yourself the treat of a lifetime. So, if you are ready to give your good ol’ batch of buttered popcorn a serious (and delicious) upgrade, look no further. These ten surprising popcorn food combinations will do just the trick. Buffalo wings with a side of blue cheese dip is a classic choice when football season is about to start. But, why slave away in the kitchen when you can enjoy this game-day staple in the form of bite-sized popcorn? That’s exactly what the culinary masterminds behind this surprising (yet delicious) combo thought, and now we’re lucky enough to enjoy it as well. Did we mention that it takes minutes to prepare? If you love tangy flavors but also have a soft spot for herbs, this popcorn combo is tailor-made to your taste buds. The earthiness from the coriander and dill seeds as well as the piquant flavor of vinegar are to die for. So, did you make your batch? Usually reserved for rice and vegetable dishes, this Japanese-inspired combo has successfully made its way into the popcorn realm. OK, we hear ya; this fusion sounds a bit unusual, but let us tell you that it’s poppin’ (ha!) with flavor. Not to mention that the crumbled nori seaweed “coats” your popcorn with all the right nutrients. So, what are you waiting for? Let’s be honest: Bacon and chocolate are probably the two best foods on planet Earth. But, what happens when you mix ’em well and toss them on top of some crunchy popcorn? Flavor explosion, that’s what. If you are a sucker for all things salty and sweet, then this combo is an absolute must-try. Quick question: What’s better than indulging in your favorite comfort food? Fusing it with your favorite snack, of course! This unique popcorn food combination merges the coziness of oven-baked potatoes with the crunchiness of popcorn, and there you have it; the perfect snack to cozy up to on those chilly winter nights when all you want to do is curl up on your couch and binge-watch the bejesus out of Netflix. A popcorn flavor that stirs up childhood memories? Count us in! This unusual popcorn food combination reminds us why #TBT should be a thing around everyone’s kitchen. After all, you can’t (ever) go wrong with cinnamon, butter, and sugar, amirite? If you like your popcorn to pack a little tangy sweetness, this one’s for you. 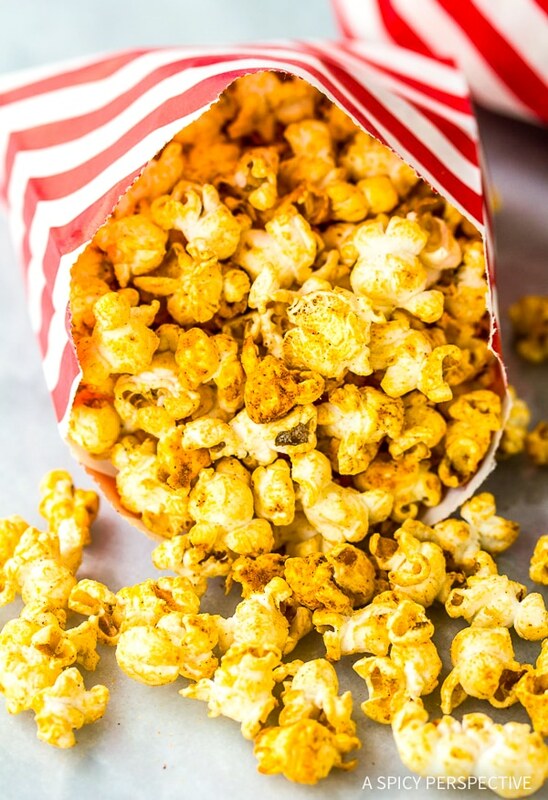 Packed with lemon zest and just the right amount of sugar, lemon meringue popcorn is the perfect snack to treat your sweet tooth (but like the healthy way). Take that, chocolate! We hate to break the news to you, but popcorn is #adulting. At least, that’s what this boozy variation shows us. Gone are the days that popcorn was the go-to snack for kids and teens. This versatile treat is now fair game for everyone who enjoys popcorn and spirits equally and wants to get the best of both worlds. We’ll drink (or chew our booze) to that! If pumpkin spice is your favorite season (shout out to PSL lovers out there), then we have just the snack for you. Pumpkin spice popcorn may sound a bit eccentric but -trust us- it’s the ultimate way to celebrate the belle of the fall and treat yoself in the process. At just three ingredients (blueberries, white chocolate, and air-popped corn), this combo is the perfect choice for anyone with a sweet tooth and a big appetite. So, all of us. Well, quickly, head into the kitchen. Scandal is about to start. So, what are you waiting for? Grab a popcorn maker and let the popping begin!